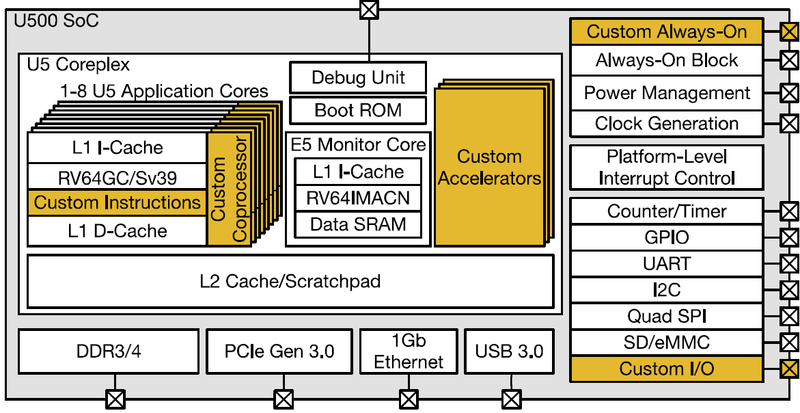 SiFive, a company established by researchers who invented the RISC-V instruction set architecture in the University of California Berkeley several years ago, has this week announced two platforms which could be used to design semi-custom SoCs based on RISC-V cores. SiFive is the world’s first and yet the only company developing chips featuring the RISC-V ISA and it already has initial customers interested in designing SoCs for machine learning, storage, embedded, IoT and wearable applications. RISC-V is an open-source microprocessor architecture developed by researchers in the Computer Science Division at UC Berkeley and officially introduced in 2010. It has since been evolved by various both academic researchers and volunteers. The CPU ISA was designed for various applications including mobile and embedded devices, and is available free under a BSD license. Those who adopt RISC-V can develop either open and free cores, or closed and proprietary cores, which is good for developing commercial projects that do not want to share secrets with rivals. A number of companies (including huge ones like Google, Hewlett Packard Enterprise and Oracle) recently joined the RISC-V Foundation, but barely any organization has unveiled an actual RISC-V-based commercial chip (what they have internally is anyone's guess). Basically, as far as we know, the technology has never left various research labs. As a result the original team that worked on the technology at UC Berkeley founded SiFive, which is going to develop commercial semi-custom SoCs for various applications featuring RISC-V cores as well as third-party IP. Chips are used for a lot of applications and in the coming years the need for custom SoCs will only grow as customers demand specialized hardware for their problem sets. However, development of modern SoCs is not a very affordable task from a financial standpoint. To build a simple chip, one needs to license the general-purpose compute cores (or ISA itself) from companies like ARM or Imagination Technologies, but to also get a variety of supporting IP (e.g., memory controllers, I/O interfaces, etc.) either from developers like Rambus, or build everything from scratch. Licensing typically requires companies to pay an upfront fee for a set of rights, and an SDK, and then royalties for every ASIC (application specific integrated circuit) containing the IP that they sell. In other words, a company building a chip needs to make a hefty investment to begin, and then the licensing fees will affect the pricing of every unit sold. Moreover, to create a chip, one needs a semiconductor development team to specify requirements, design the IC (integrated circuit), tape it out, analyze defects and implement fixes (if needed). Hiring a dedicated development team for just one chip is expensive and complicated. As a result, many newcomers need either to join bigger players (who have appropriate teams inhouse), or concentrate on software and utilize off-the-shelf silicon to build modern devices. SiFive plans to design semi-custom chips for the latter companies using RISC-V cores as well as its common Freedom platforms and technologies. Use of RISC-V cores (as well as common components designed by SiFive) is being touted to help to significantly lower development costs. The company promises that its approach will enable players without significant financial and technological backing to get their own custom SoCs with their own special-purpose IP. SiFive claims that it will be able not only to integrate third-party IP into chips, but also add custom features, such as RISC-V extensions, accelerators, or co-processors. Moreover, the chip designer can also help its partners to integrate their unique intellectual property. In fact, SiFive can manage the entire process of chip development and manufacturing and then supply its clients the final manufactured chip for commercial applications. From many points of view, SiFive’s business model resembles that of AMD’s EESC (enterprise, embedded and semi-custom) division, which develops SoCs for companies like Microsoft and Sony. The important difference between SiFive and other developers of semi-custom chips is that SiFive publishes all the low-level specs of its Freedom Unleashed and Freedom Everywhere platforms necessary for software development (e.g., memory maps, debug interfaces, interrupt control, etc. ), whereas RISC-V Foundation provides basic development tools to make it considerably easier for programmers to design software for chips based on the microarchitecture. In fact, the software side of the story here is no less important than the hardware part. The use of the BSD license for a lot of this further lowers the investments required to deliver a solution involving a custom silicon and supporting software. For example, SiFive tells us that there is a lot of standard software (e.g., FreeBSE, FreeRTOS, etc) that already works on the Freedom platforms (on RISC-V-based platforms, to be more precise), so its customers only need to focus on their particular area of chip and software differentiation. However, it has been noted that customer specific extensions to the RISC-V ISA could certainly break some level of software compatibility, depending what is used and how. Initially, SiFive will offer its clients two base platforms for different applications: the Freedom Unleashed (U500) for performance-demanding applications as well as the Freedom Everywhere (E300) for low-power devices. Both platforms have been verified with TSMC and can allow SiFive to quickly add customizations, which is what their customers require and which greatly speeds up time-to-market, simply because the bigger parts of Freedom-based ASICs have already been developed. The SiFive Freedom U500 platform will feature up to eight 64-bit cache-coherent Unix-capable RISC-V cores. Each SoC based on the U500 features four DDR3/DDR4 DRAM channels with ECC support, PCIe 3.0, USB 3.0 (with OTG support), Gigabit Ethernet, power management, a variety of peripheral interfaces (e.g., SD/eMMC, GPIO, UART, I2C, etc.) and so on. SiFive can add various extensions to the general-purpose cores to meet demands of clients, add custom input/output interfaces, custom co-processors/accelerators and other IP. The chip designer verified its Freedom U500 platform with TSMC’s 28nm process technology and thus can quickly incorporate additional blocks, tape out the product and manufacture it using a proven process technology. SiFive tells us that several companies designing solutions for machine learning, storage, and networking have already expressed interest in using the U500 platform directly with SiFive. The SiFive Freedom E300 platform is intended for less demanding applications, which is why it is powered by a 32-bit single-issue in-order general purpose RISC-V core, which can be customized or enhanced to meet specific needs. The design supports on-chip memory and can support various interface technologies, including SD/eMMC, USB 1.1, GPIO, UART, I2C and so on. The Freedom E300 is optimized for TSMC’s 180 nm fabrication process, which is 15 years old and which is still used for many chips that are not complex and do not run at high frequencies. According to the chip developer, customers working on embedded microcontrollers, IoT, and wearables have demonstrated some interest in the E300 platform. Default die sizes and cost have not been explicitly mentioned by SiFive at this time - it will be up to the customer IP and financial arrangements on a per-customer basis. The management of SiFive stresses that the two platforms, which the company announced this month, are only the beginning for SiFive and more will be incoming. At a high level, this should broaden the number of markets that SiFive can address. Those future platforms will use different process technologies depending on requirements of appropriate applications. Keeping in mind the key promise of SiFive: low-cost development of custom SoCs. 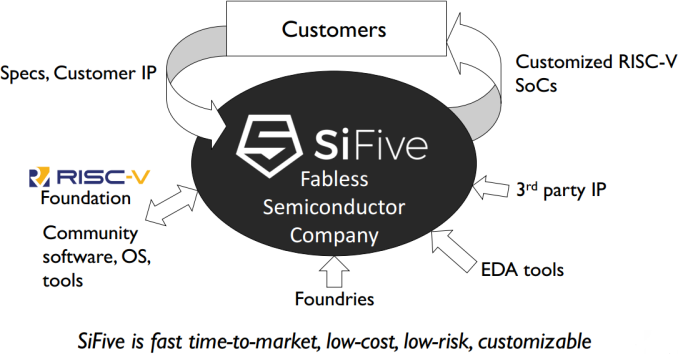 SiFive claims that it is a fabless semiconductor company which specializes in the development of various chips based on RISC-V-compatible cores. While semi-custom RISC-V SoCs may not be the most lucrative market segment, SiFive is the only player here and the company will clearly try to capitalize on its unique position. SiFive’s decision to use the RISC-V ISA is natural given the background of its founders, as well as the company’s business model (RISC-V is free). However, background and costs are not the only reason here. The interest towards the microarchitecture is growing - in recent months, companies like AMD, Google, IBM, NVIDIA, Microsoft, Qualcomm and Western Digital joined RISC-V Foundation, which manages the development of the technology. Given the nature of semi-custom chip business, SiFive cannot disclose the names of companies interested in its platforms and since this is a private company, it does not need to confirm whether it is developing any commercial chips at all. However, given the interest for RISC-V from the aforementioned industry heavyweights, it looks like SiFive is a company to watch, not only because it could build interesting semi-custom SoCs, but because it could actually develop the industry’s first commercial chips based on open-source RISC-V microarchitecture. Not so great news for ARM/Soft Bank. Nor for Intel. Really great! 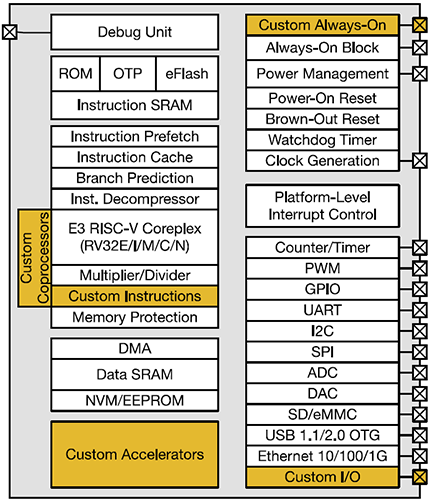 RISC-V is one of the most interesting things going on in CPU architecture right now -- right up there with Intel's MIC architecture (Xeon Phi) and the Mill CPU architecture -- not so much because its novel, but because its free and because its a clean, modern design (not encumbered by the past's poor ideas. Delay slots anyone?) and designed for extensibility. RISC-V's momentum is absolutely fascinating to watch. RISC-V workshops are attracting ever more growing number of people from big industry heavyweights as well as academic researchers. There is also the lowRISC project, a not-for-profit which is designing an open source Linux capable SoC based on RISC-V ISA, they aim to finish their design this year.